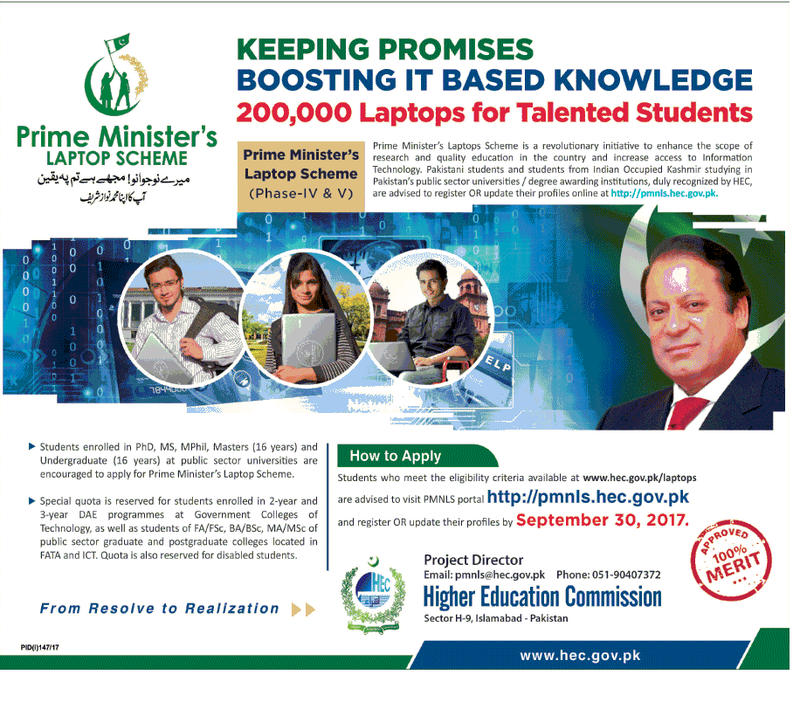 PMLN Government establishes the Laptop scheme different Youth Programs in 2013. Prime Minister Nawaz Sharif announced the scheme for five years. After the successfully completion the Phase I,II and III in 2017-2018. Now collect the application for Phase IV-V. In this Phase 200,000 laptop will be distributed amongest the talented students. All over the Pakistan like Punjab, Khyber Pakhtun Khawa, Balochistan, Azad Jammu Kashmir, Gilgit Baltistan and Islamabad students are eligible for this Scheme if they fulfill the criteria of Phase IV-V Laptop Scheme 2017. Distribute the Laptop after approved the merit list by HEC. The student don’t upset who read in Virtual University or Allama Iqbal Open University because a specific Quota is fixed for these Universities. Also FATA Graduates, Islamabad Graduates, Dars e Nizami Madrassa & Polttechnic Diploma Holders are eligible for submission application. It is golden opportunity for those students they fulfill the criteria and eligible for PM Laptop Scheme they must submit the application. Here we are providing the complete information. Lasbela University of Agriculture, Water and Marine Sciences, Balochistan University of Information Technology, Engineering and Management Sciences, Balochistan University of Engineering and Technology, Mirpur University of Science and Technology, University of Azad Jammu and Kashmir, Karakurram International University, Peoples University of Medical and Health Sciences for Women, University of Haripur, NFC Institute of Engineering & Technology, Government College for Women University, The Women University Multan, Benazir Bhutto Shaheed University Lyari, Sindh Madressatul Islam University, Bacha Khan University, University of Swabi, University of Poonch, Women University of Azad Jammu and Kashmir Bagh, Shaheed Benazir Bhutto University, Khushal Khan Khatak University Karak, University of Turbat, University of FATA and Shaheed Zulfiqar Ali Bhutto Medical University. Must be enrolled in a Public Sector University/ College /Government College of Technology. Students enrolled in Phd/ MS/ MPhil or equivalent of 18-year programme. Students enrolled in one or two-year Masters degree programme i.e. equivalent to 16-year education (morning and evening)/students enrolled in /four-year or 5-year Bachelors degree programme (morning and evening). Students studying in government degree or postgraduate colleges of Federal Capital and Federally Administered Tribal Areas (FATA). Students’ eligibility and enrolment status as defined above shall be Determined on the day of distribution of laptops. however if there is any unforeseen delay causing ineligibility of students, then those students having their online application submitted and “Accepted for Merit” will maintain their eligibility intact. Full coverage to Newly enrolled PhD, MPhil, MS 18 years or equivalent program students in any public sector HEI. Special Quota For Disabled Students. 5% Quota (i.e 2500) for distant learners/ students of Virtual University & 2.5% Quota (i.e 2500) for Allama Iqbal Open University. 5% Quota (i.e 5000) for students of Government College of Technology. 5% Quota (i.e 5000) for students of degree and postgraduate of Islamabad and FATA. FA/FSc, BA/BSc, MA/MSc enrolled Students in current year as well. 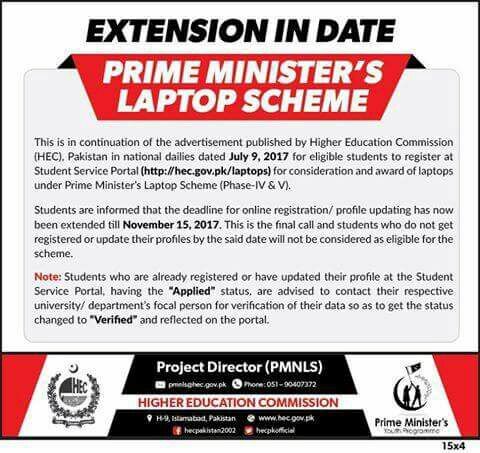 PM laptop Scheme 2018 deadline is 15th November 2018. I am adil khan, and I am disable student of B.S political science .